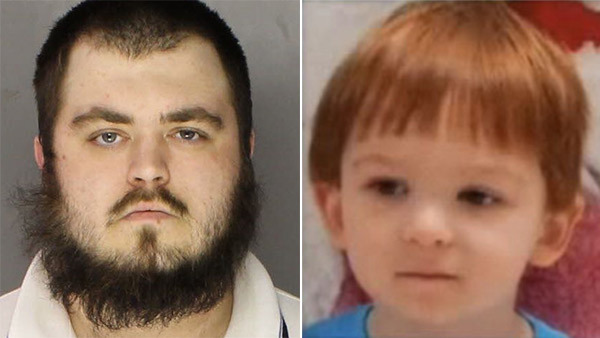 COATESVILLE, Pa. (WPVI) -- A Chester County man has pleaded guilty to the horrific murder of a three-year-old boy. Gary Lee Fellenbaum III, 25, was sentenced to life in prison without parole on Friday. Fellenbaum is one of two defendants charged in the torture and killing of Scotty McMillan. The boy's mother, 33-year-old Jillian Tait, previously pleaded guilty to third degree murder. The child died after enduring a horrific beating inside the family's West Caln Township mobile home in 2014. Authorities allege that the boy was hung upside down and beaten with fists, metal rods, whips and a frying pan, and the couple went shopping and ate pizza as he lay dying after weeks of escalating abuse. A mother has pleaded guilty to third-degree murder in the beating death of her young son in Chester County. Chester County District Attorney Tom Hogan says Fellenbaum, his wife, and girlfriend, Tait, all lived together in their mobile home and worked at a local Walmart. On Tuesday, November 4, 2014, authorities were called to their residence for the report of an unresponsive child. Responding EMTs found 3-year-old Scott McMillan suffering from bruises, lacerations and puncture wounds all over his body. Police say Fellenbaum, Tait, and Fellenbaum's wife, Amber, confessed that the little boy had been beaten with blunt and sharp objects, whipped, taped to a chair with electrical tape and beaten, hung up by his feet and beaten, leading to his death. Authorities say they beat Scotty to death using homemade weapons, like a whip, a curtain rod, a frying pan, and an aluminum strip. Police say Tait explained that the fatal beating began when the boy wouldn't eat his breakfast. Police say a man and his girlfriend are charged with murdering the girlfriend's 3-year-old son. Hogan said, "Little Scotty McMillan is dead. Over a three day period ... he was systematically tortured and beaten to death. He was punched in the face and in the stomach. He was scourged with a homemade whip. He was lashed with a metal rod. He was tied to a chair and beaten. He was tied upside down by his feet and beaten. His head was smashed through a wall." "Our ER nurses see a lot of terrible things. But when they saw his body, they wept," Hogan said. The district attorney says Gary Fellanbaum and Tait went car shopping, bought pizza, took a nap and engaged in sexual activity - all while the child lay dying after weeks of relentless torture. Tait allegedly told police that Fellenbaum beat her 6 and 3-year-old boys on a number of occasions. He would allegedly hit them with a closed fist in the head, face, chest and buttocks, and on one occasion she says he strung the boys up by their feet and beat them, while she and Fellenbaum laughed. The older child is now in the care of relatives. Law enforcement veterans tell Action News that they have never seen a child abuse murder case like this one.